With Wall Gallery Designer you design galleries of framed pictures in the environment where the pictures are to be displayed. Each gallery contains one or more scene. Each scene contains walls with framed pictues. Framed pictures, walls and scenes can be copied between galleries and scenes allowing rapid creation of new designs and reuse of previous ones. Because your design is done on virtual walls, scenes can be quickly reused other locations and are not limited to the original location. Your device can do almost all of this on its own, except it needs your help to tie the virtual 3D graphics world to the camera video stream world. In Wall Gallery Designer, you provide that help when you locate the floor and a place where the floor joins a wall. When you start the app for the first time, it will ask for permission to use the camera that is required for augmented reality. It will also ask to use location services. When you build a gallery in augmented reality, you do so faceing in a particular direction. For example, if you are designing a gallery on the north wall, you are facing north. When the gallery scene is saved, its position is saved relative to the camera. With location services enabled, the orientation relative to the camera is saved so that if you return to the same position but open the gallery scene while the camera points south, the north gallery wall will be behind the camera. As the app starts up, it must find a horizontal surface on which the walls will be placed. The height of framed pictures on wall is measured from this horizontal surface which is usually the floor. Table tops, counters and shelves are alternatives to the floor. Wall Gallery Designer will report the position of framed pictures above the chosen horizontal surface. You will go through this same locate floor-wall join process when you create new galleries and scenes or when you restart the app with location services turned off. To find the floor, hold your iPhone or iPad angled towards the floor one to two feet above it and shift it left and right as you also move it steadily toward the wall. Moving horizontally left and right gives the device the left and right views it uses to gauge distances. Jerky or fast motion creates blurred images and poor distance estimates. You move the device left and right by horizontally rocking your body to the left and then to the right. Alternatively, you may smoothly translating the device to the left and right with your arms. Twisting your body left and right rotates the camera which is not as effective at providing the parallax needed for distance measurement. With horizontal rocking it is easier to view the screen because your head and device move together. If a gray rectangle doesn't appear within 10 seconds, tap the circular Restart button in the top right hand corner. A yellow rectangular sight appears in the center of the display device once the floor is recognized. After the floor is found, a yellow sight appears at the center of the screen. Move the camera so that the sight is over a gray rectangle on the floor and the yellow sight flashes green to show that it is ready. Next, point the camera so the sight center is at the floor and wall join and tap once. buttons show that you are in the managing galleries mode. Drag and rotate the scene until the bottom edge of a green screen or wall lies along the floor and wall join. You drag or rotate an entire scene using touches that are outside any wall. The scene rotates around the orange sphere. A three-finger tap moves the orange sphere to the center of all selected walls. The distance reported in the bottom center of a wall is the distance in feet as measured on the floor from the camera to the bottom center of the wall. If the distance is wrong, tap the circular Restart button in the upper right and re-acquire the 3D information. "A towel is about the most massively useful thing an interstellar hitchhiker can have," says the Hitchhiker's Guide to the Galaxy. It can be equally useful for augmented reality adventurers. Floors are often very smooth and dark. Augmented reality uses parallax to find distances and smooth, dark surfaces provide neither the structure nor the light for it to work well. A textured white terry cloth hand towel dropped in front of your feet can dramatically decrease floor discovery time. button in the upper righthand corner, to pause augmented reality. This is especially true if you are a new user of the app. Pausing takes a 3D snapshot of the current real world view and "freezes" that reality so that the real scene no longer changes as you move your device, but you still have full freedom to manipulate the walls and framed pictures that augment the real scene. With "reality frozen", you no longer have to hold your device up towards the wall. Instead you can sit in a comfortable chair at a desk and design the gallery scene as though you were still at the place where you froze reality. When you are ready to view the scene again, return to the location where the scene was frozen, tap the circular Restart button in the top right hand corner and repeat the steps for placing the wall at the floor and wall join. Incidentally, you've seen this kind of effect in movies and TV shows where time is stopped while the protagonist moves through the scene. 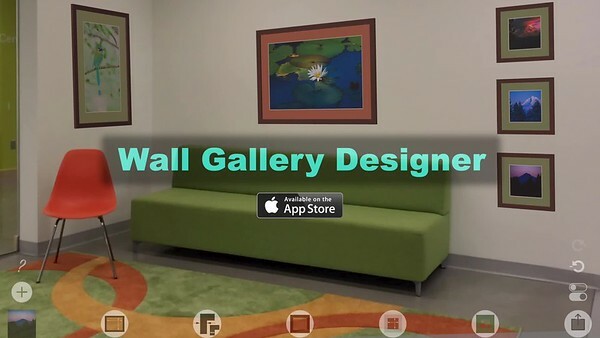 Each gallery scene in Wall Gallery Designer hangs framed pictures on one or more virtual walls. This means that each gallery scene can be reused in different locations with minimal effort. Layouts from one gallery or gallery scene can be easily copied into a new gallery scene where only the walls may need to be moved to match the new scene. ). In this mode, you can also move or alter walls, but you cannot move or alter frames. Touch one of these buttons and a menu pops up with action items. menu actions apply to selected walls. When all walls in the scene are selected, the two-finger rotate gesture rotates the scene about a center marked with an orange sphere. You can control where the orange sphere is located with a three-finger long press. A three-finger long-touch moves the orange sphere to the center of the selected walls. If you wish to rotate around a single wall, tap that wall to select it, then rest three-fingers on the display until the orange sphere jumps to the bottom center of the selected wall.
) to manipulating frames mode. A row of buttons appears along the bottom for choosing pictures, frame size, frame face, frame color, mat window size, mat color and sharing. To position a frame, simply one-finger drag it. As you drag, the wall switches to a wire mesh to help you position the frame relative to other frames. You reposition the entire scene with a one-finger drag on the background. This is convenient when you need to examine a detail up close. Simply pull the scene toward you, examine the detail, then push it back into place. Since the scene moves as a whole, you don't have to worry about accidentally repositioning some of the walls as you would when managing galleries. button. When more than one wall is present, you are asked to pick a wall for the new frame. Don't panic. Wall Gallery Designer has a many level deep undo capability. If you suddenly realize that you had all the frames selected when you picked a new picture or changed a frame color, don't panic. Simply undo the goof. button. Undo is backwards in time, redo is forward in time. Tap the question mark in Wall Gallery Designer to open pages of help. button adds a copy of a selected frame to the wall. Created too many frames? To delete selected frames, tap the Meshing gears button in the lower right corner of the screen. A menu pops up containing a Delete item. Tap Delete and the framed pictures will be removed. Delete is undoable, of course. menu. When you create the archive, you place it in a location using the share sheet. This means that you can send the archive to someone via mail or messages or add it to the Notes app. You can also choose to save the archive with the Files app in any location accessible to the Files app such as iCloud. If you share the archive with someone else who has Wall Gallery Designer they will be able to restore the archive on their devices. menu. Each archive includes copies of any framed photos in that Gallery or Scene. Besides backups, you use archives to share a scene or gallery with other app users or with support. You also use archives to transfer scenes and galleries to your other iPhones and iPads with the Files app via iCloud.